We wanted to get to know who in our neighbourhood was stepping up and putting themselves out there to help govern our city. We recognize some of the names and definitely want to get to know those we don’t. We reached out to all the councillor candidates who live in Lynn Valley and submitted their contact details on the District of North Vancouver website. We passed on four questions we thought would be broad enough to showcase their personality and their positions, but would also focus their attention on Lynn Valley and the issues that matter here. The candidates had the option to respond to the questions they chose and how they wanted. Additional responses can be found here. And don’t forget to VOTE October 20. Why do you want to be a District of North Vancouver councillor? As a lifelong resident, who’s lived in four different neighbourhoods in the District; it is home. It’s time that the DNV finds solutions to the challenges of housing, transportation and much more. People here are frustrated with the career politicians that have been in council for over a decade and want to see their Councillors offer solutions. I’m ready to offer the residents of the DNV my expertise, energy and dedication as their Councillor to move forward. I expect to be held to account by my community and to deliver results that are long overdue. Why should the public give you their vote? I am a dedicated to my community and the environment and volunteer my time to improve them both. I helped run my family business here in Lynn Valley and currently work for a membership-based organization. I earned my Bachelor of Commerce specializing in Transportation & Logistics and Information Systems at UBC’s Sauder School of Business. 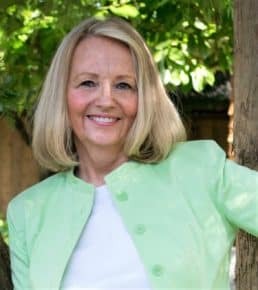 After working for five years, I returned to school and earned my Master’s in Business Administration from the Smith School of Business at Queen’s University. This well rounded experience has built strong collaboration skills to work with others with diverse perspectives will help to get things done. What issues do you want to focus on? When knocking on doors and speaking to fellow residents in Lynn Valley, the main issues we face are transportation, housing and building better communities. All three of these issues impact each other. Having the option for more people to live where they work with more affordable housing, builds better communities. People can then spend more time being with family and friends. Being able to live where you work reduces traffic by allowing people to commute in a different way, spend time in our great neighbourhood and be active, while contributing to local businesses and lessen our impact to the environment. North Vancouver has added more jobs than working aged residents; this directly adds to the congestion we face because people are commuting here! This is one example of how these issues are connected, and one of the solutions I am going to bring forward as a member of Council for the DNV. What are your priorities for Lynn Valley? Optimize roads for better traffic flow and to provide safer routes to schools and amenities for people to walk, bike and roll. I have a passion for the North Shore and all the residents who it home. I believe in advocating for the people and standing up for their concerns, needs and demands. I am honest, trustworthy, dedicated, and I’m here to listen and represent for all residents. 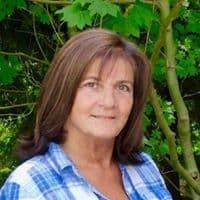 After 30 years of volunteering in programs and projects for the benefit of North Vancouver people and the environment, I feel I have gained the understanding of our community and our local government. I would like to take my knowledge of policy writing and implementation to form our policy and regulations so they have purpose, are easy to understand and have reason to them. I hear “we are losing our quality of life” I feel this is a term we should grapple with, to understand fully and then work towards having Quality of Life across our District. I would like to step back so we can monitor what is “in the works” what are we building? Do we have the infrastructure to support what is coming? (roads, hospitals, classrooms, sewage and water pipes…) are we missing pieces? What are the needs of current residents and what are the needs of those who are arriving? We have time to get this right IF we want to get it right. The lane being built on the north side of Lynn Creek bridge took 22 years that I know of, from talking of it, to construction. We best start talking now as to what our future needs are. Lynn Valley is my home. When I start to write, a travelogue comes out “A community nestled at the foot of the mountains with clean freshwater streams tumbling over rocks and logs, in our back yards and parks.” My priority for Lynn Valley is that we are able to Be Community, that we recognize our neighbourhoods and our neighbours. That we are able to find rest in our homes, parks and common spaces. Living with Nature. 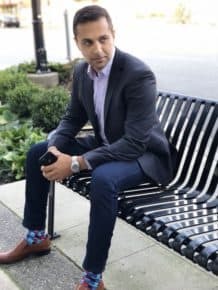 I am a fourth generation North Vancouverite and a life-long volunteer on many committees, including the OCP Implementation Monitoring Committee. I attend Council meetings, workshops, and Open Hearings. In this last term of Council I have seen that the communities questions, presentations, voices are not being heard. I want to take the communities voices to the decision table and ensure that they are heard, discussed and Council’s decisions are transparent. Professionally I am an accountant and in the past I have worked at a senior level in the District’s finance department for many years. I have worked in government, understand it’s protocols and systems. I was appointed to the OCP Implementation Monitoring Committee last year and have studied the OCP inside and out as my bedtime reading. It is an excellent document and I have been dismayed at the amount of re-zonings and amendments that the current council has done. It is a living document and is suppose to be reviewed every 5 years and we are now 2 years overdue. I want the community to have input a 2019 review. I have a number of issues I want to focus on but the top three are: transportation & infrastructure, housing affordability and development, council transparency & accountability. Transportation and infrastructure has not kept up with the pace of development so we need to slow down development until our infrastructure catches up (ie: roads, sewers, lighting, wastewater, sidewalks, schools, hospital etc.). We need a more efficient transit system to just get around the North Shore never mind trying to get over the bridges. Housing “affordability” needs to be addressed to accommodate all community residents including the young, the new families, established families, seniors and the disabled. The District needs to have a diverse range of housing and work with non-profit organizations like Habitat Humanity to provide subsidized housing. 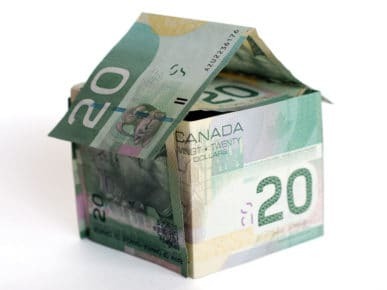 The DNV should also lobby both provincially and federally to get them back into offering incentives such as tax credits to developers to build more “affordable” housing. I would like to see the definition of “affordable” be tied to income not market. The last several years we have been building $1.2M+ market condos that are not affordable to most, causing renovictions and people leaving the North Shore as they cannot afford to live here. Workers are also leaving so businesses are now having trouble getting or retaining workers. This lack of housing affordability will result in current businesses closing and new businesses will choose to start-up somewhere else. Fall fun is returning to Lynn Valley Oct. 13! Lynn Valley Elementary School and Lynn Valley Parent Participation Preschool will be hosting their pumpkin patches to kick off the fall season. The ninth annual Culture Days Festival comes to Lynn Valley Sept. 28-30th. We’ve picked out two great events – covering hiking and local history – worth checking out, plus many other events. Lynn Valley will be buzzing with activity for the ninth annual Culture Days September 28-30th. Events and activities will be happening throughout Canada, North Vancouver and in our very own neighbourhood. Culture Days is an opportunity for people of all ages and abilities to try something new, experience something totally different, discover creative spaces in the community and meet the artists that work there. 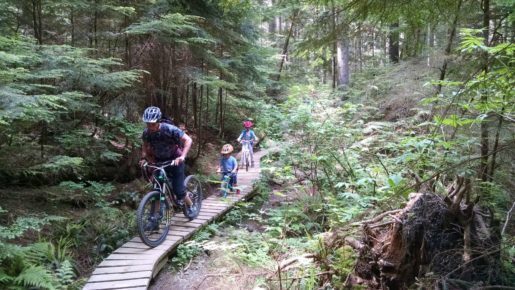 North Vancouver Parks and Recreation have centred the events at seven different “Hubs” throughout the District and City of North Vancouver. “North Shore Culture Days celebrates the vital role that arts and culture plays in creating vibrant and connected communities. We invite residents to participate, be inspired and have some fun.” said Heather Turner, director, North Vancouver Recreation & Culture Commission. At the turn of the last century, Lynn Valley isolated, forested and at the edge of the frontier. Ca. 1909. Hastings Creek bridge and boardwalk on Lynn Valley Road, with flume running overhead. 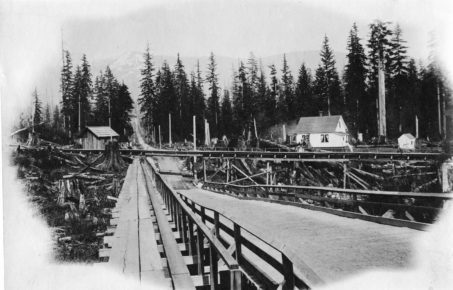 The heavily treed landscape was bisected by Tote Road, a rugged skid road that allowed oxen to haul felled logs down to the Moodyville waterfront, “Centre Road” (now Mountain Highway), and Pipeline Road, a plank road along which a pipeline was installed to carry drinking water from Rice Lake into North Vancouver. Its relative remoteness and difficulty did not keep people away. The community was first called Shaketown because of the mill – on Mill Street – producing cedar shakes or perhaps it was because of the the shake-sided shacks housing the necessary workers. “Because the workers at the mills wanted to live close by, homes were built, stores opened, clubs and churches were formed. There was an influx into the area and quite quickly it became a community,” said Dearlove. The appeal of good jobs, land and a community drew a diverse group of workers from early Chinese and Japanese workers, to industrialists from Vancouver and a number of families from Finland, plus many others, she said. “Many were like Walter Draycott – they had a sense of adventure,” she said. Ca. 1910. Depicting the new streetcar line at Lynn Valley Road and Ross Road. 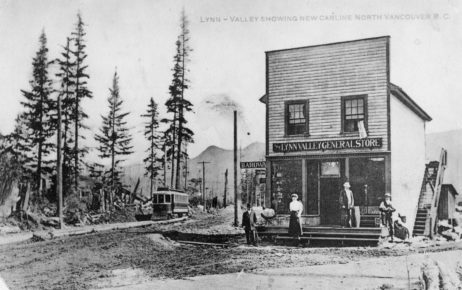 The Lynn Valley general store is at the right. The September 29th Shaketown walk will take participants on an hour-long stroll through Lynn Valley, centring on the intersection of Lynn Valley Road and Mountain. Dearlove will present historical images alongside today’s environment to explore juxtaposition of then and now. “We have some really great historical photos that show how buildings have changed or moved,” she said. The guided walk should be easy for most abilities. It begins at the Community History Centre, 3203 Institute Road, Saturday, Sept. 29, 10-11 a.m. Participants must pre-register by calling 604 990 3700 x8016. For all the Cutlure Days events check out the NVRC website at https://www.nvrc.ca/arts-culture/culture-days (for Lynn Valley events, click on the Lynn Valley Hub accordion on the webpage) or the national website at https://culturedays.ca/en. All images courtesy of the North Vancouver Museum and Archives. To learn more about Lynn Valley’s history check out this page. From zeppelin logging to secret whiskey caches, the tales and trails of North Shore mountains come alive in a new book from locals David and Harry Crerar and Bill Maurer. Highlights from The Glorious Mountains of Vancouver’s North Shore will be shared at the upcoming Culture Days Festival in Lynn Valley. For David Crerar the love of the mountains came early. 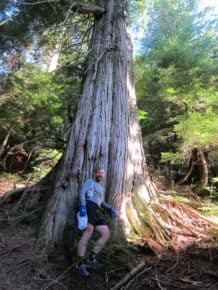 It was puttering around the neighbourhood heading off on random trails – sometimes ending up in Deep Cove at about eight-years-old after following the Baden Powell trail after school, well that was only once, he says. His passion for local hills lead to the creation of a contest to encourage local trail runners to hit as many peaks as they can in a single season. “I found there wasn’t a list,” said Crerar. So he began making one, which lead to more research and now, eight years of research later, a book is complete. 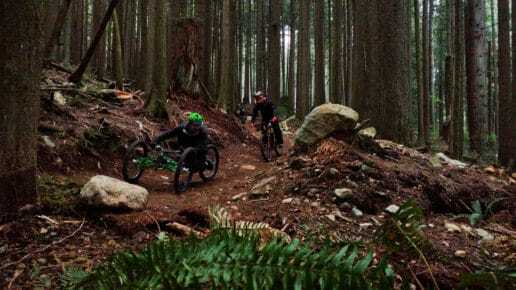 With friend Bill Maurer, and high-school-aged son Harry, Crerar has written The Glorious Mountains of Vancouver’s North Shore – a Peakbaggers Guide that goes well beyond the typical trail guide. “In the marvelous 105 Hikes by Stephen Hui, it covers, I think, only 10 of the hikes,” he said. “And although it is classified as a hiking book, I almost prefer to think of it as everything you need to or wanted know about these mountains in our backyard. Even folks who aren’t hikers will find history and culture. The authors also recognize the history in the mountains extends well past the European contact. There a nuggets and secrets like this peppered throughout a short conversation with Crerar. The depth of his local knowledge perhaps only trumped by his enthusiasm to get outside. Take Lynn Peak for instance, right in our own backyard. 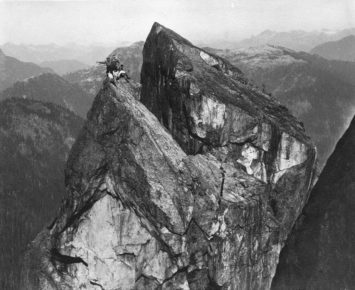 Much of the research the authors undertook was at Lynn Valley’s North Vancouver Museum and Archives and the Community History Centre, which also houses the BC Mountaineering Club archive. David Crerar will be returning Sept. 29th from 2-3 p.m. to share more secrets from his book and local highlights. Pre-registration is required: call 604 990 3700 x8016. 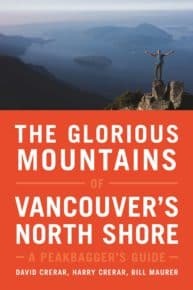 David Crerar’s book The Glorious Mountains of Vancouver’s North Shore is available now and he will be speaking Sept. 29 from 2-3 p.m. at the Community History Centre 3203 Institute Road, Lynn Valley. Pre-register: 604 990 3700 x8016. Photos courtesy of David Crerar and Rocky Mountain Books. There have been some changes and lots of chatter about the local housing market in the last few months. LynnValleyLife’s experts believe strongly that for some it may be the perfect time to make a long awaited move. While some segments of the housing market are going strong, others are measurably dropping and every indication is they will continue to do so. Combine this with the new tougher lending rules which have taken many buyers out of the market and the result is a unique opportunity to “move up” for those who have or can gain access to some funds. There is no time like now to do your homework and see if you fit into this group. Take a look at the last few years and assess your life changes – promotions, additional income, less debt – and how they have impacted your borrowing capacity, says Lanctot. September is a great time to reach out to your broker or touch base with one of several experienced LynnValleyLife’s mortgage brokers such as: Mortgage Dave, Tim Hill or Linda Findlay. The fluctuations and changes in the real estate market haven’t been affecting the different price segments equally. The typical balanced ebb and flow of a buyer’s vs. seller’s market isn’t happening in Lynn Valley right now. Above the $1.7M mark the market shifts dramatically towards a buyers market, he said. “If sale prices are dropping at certain percentage – for example a $2.5M home last year looks like it will be selling for less and you are selling your home for $1.6M it means you now have a smaller step up to buy,” adds Kelly Gardiner, LynnValleyLife founder and realtor. September is a great time to harness the momentum of summer’s end and reassess the future. The LynnValleyLife office is located at 3171 Mountain Highway. Jim Lanctot and Kelly Gardiner can be reached at 778-724-0112 or at JL@lynnvallelife.com or Kelly@LynnValleyLife.com. The streets and local schools will soon be buzzing with small, medium and large feet. This is a great time to think about how your children are getting to school. Studies show that students who are able to have some physical activity before class are more mentally prepared to learn, have better physical fitness and moods, and improved safety from less cars on the road. The North Vancouver School District is encouraging students and parents to leave the car behind. Students come from all over North Vancouver to attend Argyle Secondary – whether for the French Immersion program, special sports academies or its unique education programs. While much of the school population does live within walking distance, there are plenty of commuters that need to make their way school. 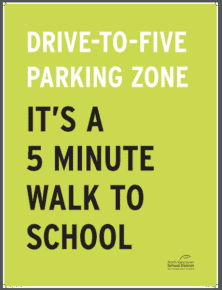 With construction vehicles and congestion from the school’s new build, consider SD44’s Transit/Carpool/Drive-to-Five campaign: ​If students cannot walk, cycle or roll to school, then public transit, carpooling and ‘drive-to-five’ are the next best options. These options reduce congestion around schools, which is much safer for students (and much less stressful for parents). Public transit and carpooling are also better options for environmental preservation than driving individual cars to and from school. Drive-to-five gives students an additional five minutes of physical activity twice a day, which has both physical and mental health benefits for students. Both carpooling and drive-to-five also create community connections with other families. With Lynn Valley Centre a five minute walk away – it’s the perfect place to take a bus. 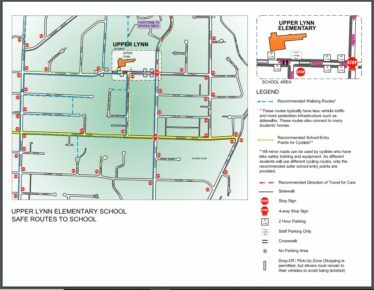 There are plenty of active ways to get to school and school district has partnered with the District of North Vancouver to publicize the safest active transportation routes to neighbourhood schools. The Transit/Carpool/Drive-to-Five campaign also can work for older elementary students and all-round will make the streets safer for all students by reducing traffic around the congested school areas. PLAN & PRACTICE! Plan your walk or cycle route in advance, and then practice it and adjust as needed. HUB has also created a cycling routes map of North Vancouver. LOOK! Always look left-right-left and shoulder check before crossing. LOOK! Pay attention to where you are going and do not use your phone or device while walking/rolling. LISTEN! Remove your headphones so you can hear approaching traffic. BE SEEN! Wear reflective materials or bright clothes and use lights after dark. VISIT! Visit the Active and Safe Routes to School website section on the North Vancouver School District website for more walking and rolling tips.